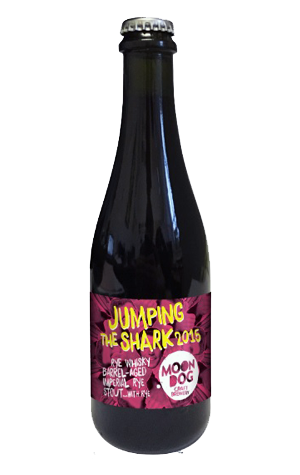 The third Jumping the Shark annual special from the Moon Dog crew has been long in the making. A pre-barrel, pre-freeze distilling sampler went on at the brewery months ago but the finished product has only just been released in bottles for the end of the year. Just in time for summer, in fact – the perfect time to sit down with an 18.4 percent ABV rye imperial stout that spent four months in rye whisky barrels from Tasmania's Belgrove Distillery. According to Moon Dog senor brewer Adrian McNulty: "The thinking behind it was to try and make a stupidly high alcohol beer that didn't taste like straight up nail polish remover, a la REDACTED." As for why such a big beer is coming out in summer, he says: "Because #$%^ everyone." Before adding: "And we've been busy with other things, but I can guarantee that as a knock off on a 38 degree day, you can't go wrong." Time was needed to get the barrel character they wanted too, with the result a "stupidly tasty" melange of "rich dark chocolate, molasses, hazelnuts and boozy rumminess." NB: We're giving away a bottle of JTS 15 as the first prize in our new monthly competition for members of our Crafty Cabal. Post a photo to Instagram or Twitter each time you redeem an offer – using #craftycabal, tagging the venue and entering your Cabalista number – and we'll select our favourite to win the bottle at the end of January 2016.